There are three living surrealists in cinema who are still actively working to this day. David Lynch seem to give up back in 2006 with Inland Empire to focus on his new age campaigns (which he calls transcendental meditation) but were able to make a come back in 2017 with a new season of Twin Peaks. Alejandro Jodorowsky is doing stuff again with his last two films being consistent with his works from his early days. Insects is Jan Svankmajer’s second curtain call for himself. I remember him calling it quits 8 years ago with Surviving Life (within the same year as Bela Tarr’s retirement). This might not be a complete retirement for him, as I’ve read somewhere. Seems like he’s only doing what Hayao Miyazaki is doing: retirement from feature length films. I can see the reason why. At the advent of entertainment explosion everywhere, cinema seem to be less and less of priority when it comes to pastimes. 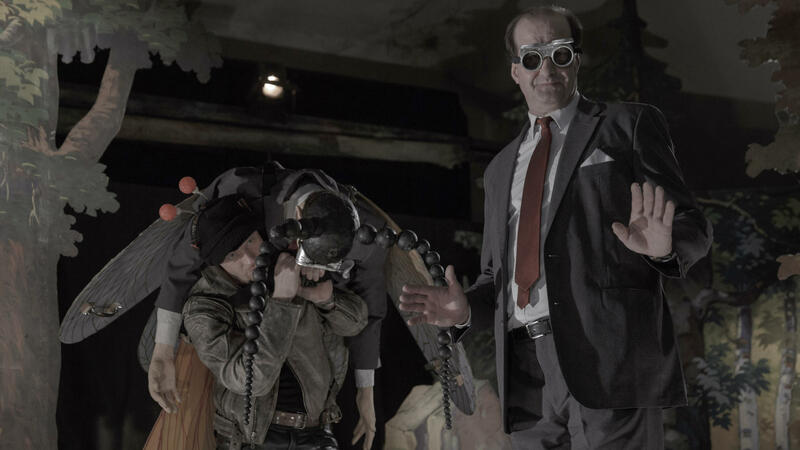 Arthouse filmmakers like Svankmajer, much as they get very privileged status in cinematic discourse, can’t seem to ensure economic stability without having to compromise with mainstream / Hollywood framework. And with Svankmajer, you really just can’t make his films compromise. But it is less because of an artist’s stubborn personality. His films are in a way, impossible to be mainstream. It’s weird seeing this film now. It seems to be something which you may see on a retrospective along with, say Last Year at Marienbad and 8 1/2. Its reflexivity has more of the modernist / futurist claim for artistic autonomy than it is of a postmodern musing. And Svankmajer is there to assure that. I’ve already said enough of this work. This would probably be a summing up. Its form makes you need to take it seriously. Some took it as your regular Black Mirror material. You know, your favorite dose of cynicism and capitalist realism. The acceptable Thatcherite neoliberalism for the semi-woke to ignite your unconscious anti-working class sentiment (while still keeping it unconscious). You know, it doesn’t offer much for the future, and therefore it’s cool. Bandersnatch works best if you do not take its content seriously, like most Black Mirror episodes. It’s a great exercise in cinematic expression, of course. Like the best of British TV, it moves like a film, conscious of the smaller screen size. But none of the form is new. Bandersnatch is self-conscious of it. It presents these three layers of reappropriation of the “choose your own adventure” (CYOA) literature. Which its way of admitting that none of these are original. Narrative-wise, it presents this interesting speculation that, what if, back in the 80s, there’s a CYOA novel which was done by a lunatic? It is in this aspect that a really good (possibly radical) element of the schizophrenic that Bandersnatch initially present. Only to suppress it, of course, in the guise of negative popular discourse surrounding schizophrenia. Reverting back to the very neurotic character of the control freak paranoid of control. There’s several endings for the material. All of them are admittedly quite a disappointment. Like most Black Mirror endings, all of them are non-endings. Symptomatic most probably of its capitalist realism. Although the processes of getting to the ending are most enjoyable much as they are frustrating. The illusion of control is what makes it attractive. It is this auto-generation of pain-enjoyment that one can’t really dismiss Bandersnatch as mere hype. Or perhaps, this pain-enjoyment is the reason of its hype. Like in a Black Mirror ending, you’ll realize you’re not really in control. But then again, like all good ideological deployments in cultural products there’s the good old Zizekian formula: you actually know, but you still did it. What could possibly go wrong with a dystopian film? Nothing much. It’s already wrong. It’s dystopian already. I really wanted to love the film. But it has this TV Movie feel that as if none of these were taken with really great consideration. It has these bits of things which is good. Charlie’s character provided a really good metacritique of prominent trends in dystopian literature. But, I don’t think this critique is what the film needs. It probably needs more meta: why not a critique of dystopian literature itself? 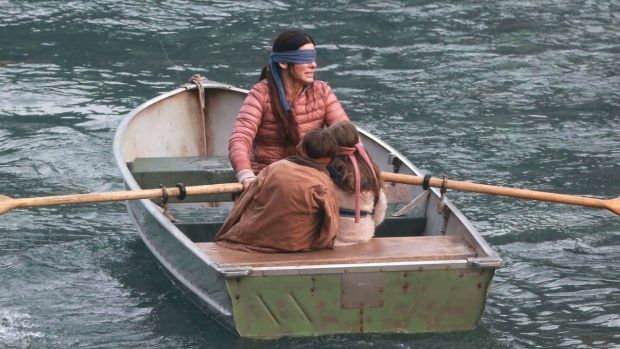 Bird Box‘s dystopian apologism, however, provided an indirect counter argument with Jameson’s “it’s easier to imagine the end of the world than the end of capitalism.” Essentially, the film answered just that: capitalism ended with the alien invasion. Only it ended with a positive feedback against the “creatures”: if the problem is seeing, we can just forget seeing completely. Looks like Saramago’s Blindness in reverse. Again, like Black Mirror, it concluded with a non-ending. None of the home of the blind sanctuary helped resolved the real threat of the creatures. Then again, like most dystopian literature, there’s only two options provided: non-resistance or compromise. BlacKKKlansman is clear with its intent. It does not really resolve a compromise between being with the police and the black liberation. Its conclusion made it sure. What it highlights more is the solidarity produced by the Black Liberation not just within the movement, but even outside of it. In the end, it doesn’t really exclusively give priority with black liberation, as white-extremist reaction would have it. Although the form might make it seem like it. It all boils down on whether the film can hold firm of its position transhistorically with the method it uses for now. It seems that the film tries to negotiate between the state disciplinary apparatus and black liberation while making us shift its focus on the infiltration mission. BlacKKKlansman seems to situate itself within the specificity of its time. But then again, this is cinema. And what’s more, Hollywood cinema. What it gets wrong, is that it falls bait with all of Trump’s racist drama. That it only stand within this specific wrong: what if Trump changed his mind? In the end, BlacKKKlansman will remain reactive. There’s a lot of potential in the material, but it falls within this very respect of the source that it did not get to fulfill its full potential. Then again, there goes its limit as a biopic. There seems to be a lot of negative reaction against Michael Moore’s latest essay. Mostly coming from his supposedly “empty” ranting. Of course, he can be as liberal as he gets. But thanks to this recent development at least we can hear a disavowal of the classic AND the neoliberal framework in the frame of class struggle. There’s a bit in the film wherein Moore addressed this necessity to reshift our focus on the working class instead of dividing our attention with identity politics. That identity politics — whether racial or gender politics — have indeed been reappropriated by bourgeoisie as their tactic in the dawn of the 21st century, to reassure votes, and therefore, have them remain in power. Something BlacKKKlansman seem to fleetingly address but only to present it as white discourse. But Moore seems to be naive with his trust of the young ones trying to change Democrats. I’m not really sure though how to respond to this properly as a Maoist, since it seems to be a very valid tactic on my standpoint. But, what also needs to be addressed is that it should be transitory. Like how representative politics should have been transitory on any actually working democracy. As a political material, I think, there’s more to learn here than on earlier attempts of Moore to critique politics on his middle-aged naivete. This fruitful maturity is welcome. No matter how gimicky Moore has become, seems like his resolve in here goes beyond mere gimick: this is an actual document of Moore making an action. The image above becomes more of a symbolic act for a direct action against the perpetrators. He’s alone there. What more if there’s a crowd to flood the governor with the poisoned water he made Flint drink?